Online leads: do you act timely to respond? 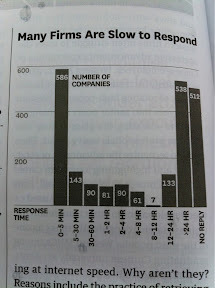 Reading an interesting research summary in HBR that I wanted to share. – and 23% never responded at all! As companies are investing significantly to get prospects out of the web, they should have a much better turnaround, don’t you think? Reasons not to do so include retrieving leads from CRM daily rather than on the fly, sales forces focusing on their own generated leads and rules for leads dispatching not effective enough (“fairness” can be damageable). Where are you with this? Better know where your marketing ROI is headed sooner than later. How to measure your brand’s online influence? “Measuring online influence can be useful—and has potential to reinforce your social-media strategy (hey, it just feels cool when you get a high score)—particularly for growing brands looking to utilize technology to make their jobs easier and more effective. However, it’s not for everyone.” — Dave Smith, Inc.
preaching for an evolving approach. At the end of the day, there is in my opinion no option for all of us to engage into measuring our brand’s influence online. We better get starting ASAP and make our plans on how to do it. This is what I am doing already for the brand I work for which faces an interesting challenge to do it with one voice globally. Your feedback and experiences are more than welcome on this blog. – 68% of consumers who posted a complaint or negative review on a social networking after a negative holiday shopping experience got a response from a retailer. On top of it 50% of consumers say great customer service/experience influences their decision to buy from a specific online retailer and after a positive shopping experience 31% purchased more from this retailer. Finally, 28% of consumers looking for information or support with online shopping researched what other customers said on social networking and reviews websites. In many cases, the 32% of US consumers who posted a negative review of a holiday shopping experience in 2010 and were ignored by the retailer simply had a bad impression reinforced. Six in 10 (61%) of these consumers said they would have been shocked had the retailer contacted them. So YES social media has a growing influence on your customers loyalty and you should be paying attention to it. Actually we all know that a happy customer is the most effective sales influencer when turned into an advocate. According to the same research, for consumers who had a positive exeprience this holiday season online, 21% recommended the retailer to friends and13% posted a positive online review about the retailer. This is the question I get very often even from marketers already involved and active in Social Marketing: how to identify influencers? Yes, seems like 101 but actually not so easy to figure it out. Pretty wide isn’t it? But for B2B marketers like me this is so true and so daunting. Today’s Marketing 2.0 reinforces and stresses our imperative to identify them and reach out to them through social media because we need them to be involved in the conversation, hopefully positively. To start with today, I wanted to share with you this blog post: Social Marketing: Hybrid Approach to Identifying Targeted Influencers. Dive in as Elliott’s post has lots of tips and links to tools and present it in a very simple way. His Hybrid approach actually refers to a combination of manual operations and free services you can use if you’re on a budget contraint and cannot hire an agency to help you. Enjoy! Here is an interesting post about optimizing your social media marketing from David Kirkpatrick, Marketing Experiment. Having a solid social marketing methodology in place will allow you to focus on real obtainable goals. How does your marketing compare to best in class? A recent research from Aberdeen about Marketing Asset Management gives an opportunity to compare to the best in class. 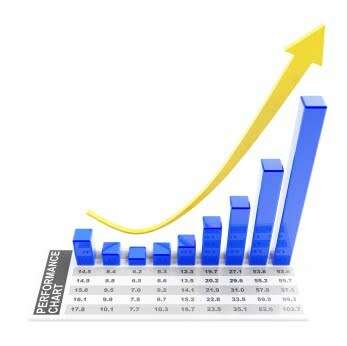 15% average decrease in year-over-year time-to-market of content of all types and formats, as compared to an increase among laggards. Seth Godin gives a tour of things poorly designed, the reasons why they are that way, and how to fix them.